Blood Sugar Stabilizer by Ascend Nutritionals Reviews - Hype or Legit? Managing your blood sugar can be maddening. Ascend Nutritionals’ Blood Sugar Stabilizer claims to help you regulate your blood sugar through the use of 20 different natural ingredients. 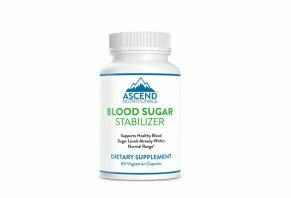 Blood Sugar Stabilizer is a supplement from Ascend Nutritionals that uses a blend of fruit, flower and bark extracts along with a mix of vitamins and minerals to, as the company claims, provide stability for your blood sugar levels. The supplement is intended to be used by those who have issues controlling their blood sugar, a condition that diabetics often face and that is integral to control in order to maintain health and wellness. As a result, they note on their site, their products contain natural ingredients and are made in the United States. In this review, we’ll discuss how the supplement claims to work, what the science says about its ingredients’ effectiveness, possible side effects and how much the product costs. We’ll also compare it to other supplements that claim to stabilize your blood sugar. The key to Blood Sugar Stabilizer is its blend of 20 ingredients that are, according to Ascend Nutritional’s websites, anchored by research-backed minerals, fruits, and flowers that have proven to have a positive effect on individual’s blood sugar level. What’s impressive about this claim is that the company provides a link to a list of more than 97 studies that show positive effects from the various ingredients included in each pill that you take. The list of studies is best split into two categories – minerals/vitamins and plant-based ingredients. Around 39 of the studies pertain to the plant-based ingredients, whereas 58 students pertain to the vitamins and minerals. What we noticed is that there are an average of 4 studies per plant-based ingredient and six studies per vitamin and mineral. This tells us that, based on the information they’ve given, there’s more evidence that the supplements vitamins and minerals help with blood sugar than there is about the plant-based ingredients. Now, this isn’t out of the ordinary for supplements, as many of them hail the powers of offbeat ingredients to help you manage or lessen the effects of a particular ailment. These types of ingredients are exciting in a certain sense because they’re probably different than what you’ve encountered, say, in a doctor’s office. As for how often you take this supplement, the directions say that you should take one pill twice a day between 20 and 30 minutes before a meal. You should also drink eight ounces of water with the pill. It’s really important to realize that because blood sugar regulation is often an issue with diabetics that the FDA has not approved any of the claims that Ascend makes about Blood Sugar Stabilizer’s effectiveness or how its ingredients work. Now, to Ascend’s credit, they don’t mention any disease on their site. Rather, they provide multiple studies that indicate each ingredient may have a positive effect on blood sugar levels. We say all this so that you’ll realize the lack of regulation of these types of products means they may or may not work for you. One of the ways, however, that you can judge the efficacy of a particular ingredient is to refer to reliable sites like WebMD to see what they say about a particular ingredient. Rather than tackling all the ingredients in Blood Sugar Stabilizer, we’re going to review the plant-based ingredients for which the company provided the most clinical studies: cinnamon bark powder (nine studies), bitter melon (five studies), white mulberry powder (five studies) and yarrow flower powder. WebMD says that cinnamon has a multitude of uses relating to health but that the evidence present for its effectiveness in regulating blood sugar is mixed. It’s important here to note that cassia cinnamon is what research has shown to possibly help with blood sugar. RxList points out that “cinnamon bark powder” could be all different kinds of cinnamon, one of which could be cassia. Ascend’s supplement page doesn’t indicate which type of cinnamon is used in their supplement, so we can’t say for certain if they use cassia cinnamon. According to WebMD, bitter melon contains a chemical that mimics insulin, a chemical in the body that’s vital in regulating blood sugar so that it doesn’t get too high or too low. However, even though it contains this chemical, WebMD says that existing studies about bitter melon’s effectiveness in helping with diabetes are conflicted and not conclusive. While the first two ingredients on this list have conflicting research about their effectiveness, there are chemicals in white mulberry powder than help break down blood sugar. In fact, they say that taking mulberry leaf powder could lower your fasting blood sugar levels by as much as 27%. However, the site points out that these results were achieved by taking at least 1 gram of mulberry leaf powder “three times a day for four weeks.” The label on Blood Sugar Stabilizer indicates that each pill has 25 mg of white mulberry powder. If you take two pills a day, your daily intake will be 50 mg, which is just a fraction of the amount of powder that WebMD says you’d need to take to see results. We checked out WebMD’s information regarding yarrow flower powder and could find no mention of the powder’s effectiveness in regulating blood sugar. While reading through WebMD’s analysis of the various plant-based ingredients, we found that there were warnings about bitter melon and white mulberry. Because the two ingredients have chemicals that could lower your blood sugar, the site advises that you watch your blood sugar levels after you start taking them. “White mulberry might lower blood sugar levels in people with diabetes. Watch for signs of low blood sugar and monitor your blood sugar carefully if you have diabetes and use white mulberry,” WebMD notes in the Side Effects section of their white mulberry page. It goes without saying that you should consult your doctor about adding a supplement to your daily regimen. We think that warning is critically important for Blood Sugar Stabilizer, as it most likely will appeal to those with blood sugar issues stemming from diabetes. Bring a bottle of the supplement to your doctor so he or she can review the ingredients and provide his insight about how those ingredients might affect your health and/or interact with drugs you’re already taking. At the time of publishing, you could buy one bottle of Blood Sugar Stabilizer for $69, three bottles for $177 or six bottles for $294. There are two ways to lessen the cost of the supplement. Buy multiple bottles at once or enroll in the supplement’s AutoRefill program, in which Ascend automatically sends you a replenished shipment (one bottle if you ordered one, three if you ordered three, etc.) and charges your credit card for the auto-refill. To help you keep track of your shipments, Ascend says they’ll send out an email before they ship your AutoRefill, at which point you can pause, skip, modify or cancel your subscription via your online account. Also, the site gives you a 60-day money-back guarantee. This means that at any point during the 60 days, you can start a return if you’re not satisfied with how the supplement is working. To start your return, you’ll need to contact Ascend’s customer service at 800-304-2795 Monday through Friday from 9 a.m. to 5 p.m. EST or by emailing their support desk at support@ascendhelp.zendesk.com. Our Final Thoughts About Ascend Nutritionals Blood Sugar Stabilizer: Are There Alternatives? Based on the research we’ve done and the information provided by WebMD, we believe that there is some merit to the blood-sugar stabilizing effects of some of this supplement’s ingredients – namely, white mulberry powder and bitter melon. However, there is a chance that the ingredients won’t work quite as well as you hope simply because the white mulberry powder isn’t available in this pill in the dosage you’d need to see effects discovered in studies. Even though this could be what happens, it doesn’t exclude the possibility that the supplement could help lower your blood sugar. That being said, we think that the supplement’s greatest drawback is its price. We were able to find other supplements that contained three times the bitter melon dosage and eight times the cinnamon content for less than $10 (Swanson Blood Sugar Manager). We also found a supplement on Amazon – Sunergetic Blood Sugar Support – that contains all the plant-based ingredients that Ascend’s does but for $19.95 per 30-day supply. In our opinion, some of the ingredients in Blood Sugar Stabilizer can help with your blood sugar but the dosage may not be enough to have a significant effect. If you think you want to try a supplement to help with your blood sugar, we found cheaper options out there. Whichever product you choose, we strongly encourage you to talk with your doctor about the ingredients before you buy it, as diabetes is a serious disease that requires a strategic approach regarding medicine, supplements and food intake. Write a Review for Blood Sugar Stabilizer by Ascend Nutritionals!